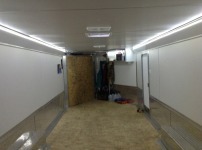 In the pictures, you can see the Brite Lites LED strips in white along the wall tops, and the Brite Lites Double Dome LED Lites in the center of the trailer. This is a 24' car hauler with a 5' V-nose. We have 5 Double Dome LED units spaced along the center of the ceiling, giving us about 2000 lumens of usable light. 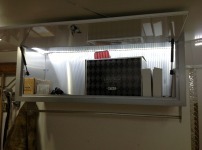 Then we put 2 25' white LED strips along the top of the side walls and into the storage container for extra lighting. The 2 strips run the entire length of the trailer and are great because it is evenly distributed and no bright spots to blind you, or dark spots that are hard to see. The 2 long strips add 3,750 lumens of light and are simple to install. We have this trailer set to work. With the Double Bay LED Dome lights in the center and LED strip lights on each side, we are looking at almost 5,000 lumens of light to do about anything! 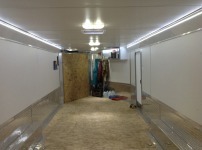 Here you can see that the evenly spaced LEDs on the strips, over 900 LEDs around the top of the walls, make the majority of the light inside the trailer, and it is very even, no dark spots or blinding light. 3,750 lumens with these 2 light strips on. To make the storage unit as practical as possible, I wrapped a short section of white LED strip inside this cabnet so we can see what's inside no matter how dark it is!